Unlike most other bird species, which reach full sexual maturity in a matter of months, young male superb lyrebirds do not grow their fancy, elaborate tails until they reach three or four years of age, and only when they are six do they acquire the extra filamentary feathers that make their appearance so dramatic. Until then, they cluster together and are known as "plain-tails." The males of both species sing a lot and use their tails to perform an elaborate courtship display for any approaching females, arching their fanned tails over their backs to form a canopy. The males occupy and defend trampled mounds of vegetation, mating with any female who allows them. Females build a messy, dome-shaped nest of sticks near or on a moist patch of ground in which they lay a single, purplish gray, spotted egg. 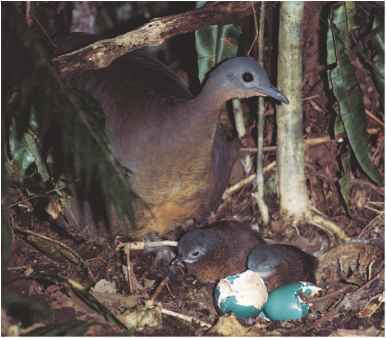 They incubate (keep warm by sitting on) the egg for six weeks without assistance from a male, and the nestling remains in the nest for six to ten weeks.